Use of the mobile Web is set to overtake fixed-line Internet in India by the end of the year, as the country’s mobile revolution continues at full speed. 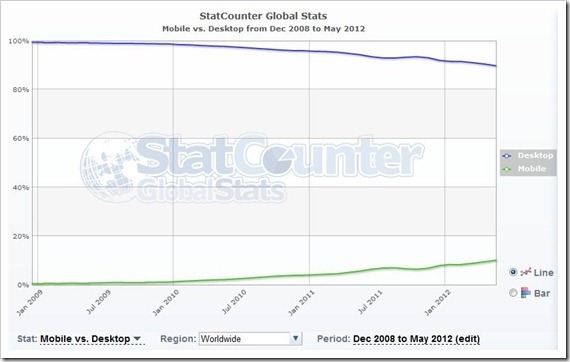 Statistics from statcounter — via Trak.in — show that a steady depreciation in the use of Internet from PCs is coinciding with continued grow of Web surfing from mobile devices. The data suggests that, with PC usage just a few percent points ahead, the lines will cross and access from mobile will overtake the PC before the end of the year. As the graphic shows, India’s mobile Web usage has grown strongly to account for just under 50 percent, as March-April, that’s up from just 2 percent in January 2009 and 18 percent in January 2011. With the price of Internet prohibitive for many Indians, not to mention that infrastructure issues restrict access to services in rural areas, mobile has emerged a more cost efficient and convenient Internet access point. These reasons are behind the ‘leapfrog’ effect, that sees mobile Internet usage proportionally highest in emerging markets, as Pingdom explains. The good news for India is that, following relatively late introduction of 3G in 2010, the 4G roll out has begun after Airtel introduced its service last month. Although limited to dongles and the city of Kolkota initially, the service will bring about “fundamental change” nationwide, according to Airtel CEO Sanjay Kapoor. As is the case in other countries, 4G offers the potential to increase Internet access and provide a better, faster user experience, once more compatible handsets are active in the market. Last year I wrote about the ways in which the growth of mobile Internet is disrupting traditional measurement of the Web, and India is a good example. Internet penetration in the country is less than 10 percent but, given the rise of mobile as an access point, the stat literally tells only half of the story. Mobile Web use is increasing across most other parts of the world, thanks to the ever-growing proliferation of smartphones — which saw global shipments increase 42.5 percent year-on-year — but India’s low use of fixed-line net access makes the trend more prominent in the country. While India’s stats don’t break out the dependency on mobile Web — ie how many Internet users are mobile-only — a recent report suggested that as many as 38 percent of mobile Web users in China go online from their phone or tablet device only. With more than one billion mobile phones in China, that’s an awful lot of mobile-only browsing, and it again illustrates the importance of mobile, which is set to become (or already is) the primary Web access platform in many emerging markets. 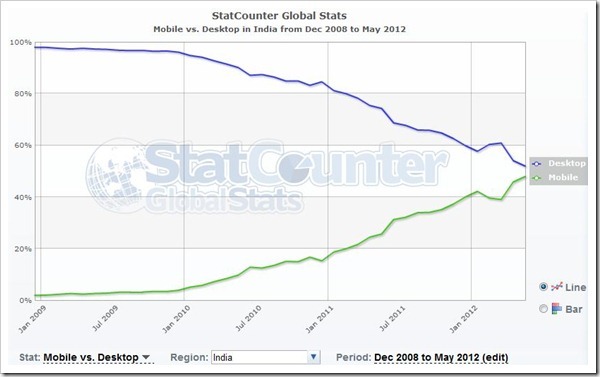 While the Statcounter data is likely to have its anomalies, the overall trend clearly shows that the number of mobile Web users in India will soon overtake those accessing from PCs.